The Ruby on Rails test is designed to assess the programming skills of prospective candidates before ever inviting them to an interview! This 20-question quiz was compiled by a team of professional developers and covers a broad spectrum of Ruby on Rails knowledge. Like all Tests4Geeks coding tests, the Ruby on Rails online test is designed to help you select the most-qualified candidates to interview. What will happen when the update action receives the following parameters? 1. The user model will not be updated because an unexpected parameter was provided, and the user will be redirected to the edit page. 2. The user model will be updated with all the provided parameters. 3. 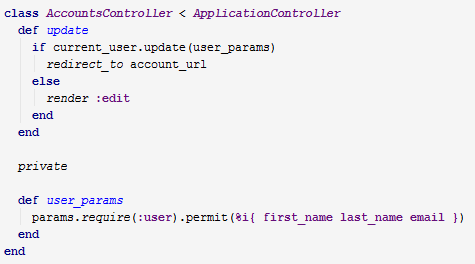 The user model will be updated with the provided first_name, last_name and email parameters. 1. Do different test-takers see different questions? No, everyone who takes the Ruby on Rails test sees the exact same list of questions. That's because the only way to accurately compare test scores is to ensure that everyone takes a test of the same difficulty level. The only difference between one test and another is that the questions are reshuffled. 2. What's indicated by a exam score? This RoR online test is designed NOT to help you discover the greatest developers. It's designed simply to help you weed out the least-skilled ones. Skill as a developer involves a wide variety of aspects – not only coding ability, but also experience, teamwork, and many other factors. That means a perfect score alone doesn't necessarily indicate the best developer for the job. If your candidates receive scores of 35, 45, 60, 65, and 80, it's smart to invite the ones who scores 60, 65 and 80 to the review – in other words, the top three, not only the one who got 80. Don't leave the final decision up to a Ruby on Rails interview test score. Make sure you hire the developer that fits best on your team. Whereas some tests require candidates to write their own code, our test comes in the format of a quiz: candidates choose answers from lists of options. We use this format because Ruby on Rails coding test requires manual checking. Any coding problem has multiple solutions – which means there's no way to validate correct answers automatically. However, we currently have plans to enable customers to include custom questions on the RoR quiz, so you can assess candidates' ability not only on the questions we provide, but also on those you add. Please feel free to give us your input about this feature! 4. What's the difficulty level of this skill test? This test's main target is mid-level Ruby on Rails developers. It can also be useful for testing lower-level developers – keeping in mind that they're likely to score significantly lower. By the same token, you can also use this Ruby on Rails exam to score senior-level programmers, adjusting the grading curve upward. If you're thinking that senior programmers should be given a completely different test than mid-level developers, that can be true – but only in terms of particular industry-specific skills. What's more, this RoR skills test can be a helpful tool for weeding out programmers who claim to be senior-level, when in actuality they're only mid-level.